"In Spring next year James Bond will return as we’ve never seen him before. Ian Fleming Publications Ltd is thrilled to announce that in March 2005 Charlie Higson will take us back to where it all began in the first of his novels introducing the teenage years of the boy who was to become 007. 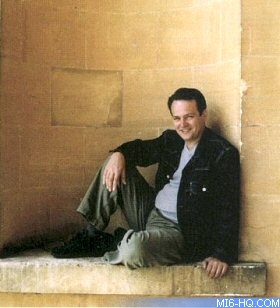 Charlie Higson is co-creator of the hugely popular The Fast Show and is a successful film and adult thriller writer. He’s also a firm fan of the original Ian Fleming Bond novels and, with meticulous research, he has created an authentic 1930s world for Young James Bond that fits seamlessly with Fleming’s." "Ever since having children of my own I’ve wanted to write a thriller for kids, so when I was approached by the Fleming estate to work on a new James Bond series for younger readers it was too good an opportunity to turn down. "I’ve grown up with Bond, and whilst I’ve had to finally accept that I’ll never play him in the films, writing about him is even more exciting." The Fleming family are delighted. Lucy Fleming, Ian’s niece, said yesterday "Charlie’s done a wonderful job in capturing the essence of my uncle’s James Bond." The first adventure will be published in the UK by Puffin. Rebecca McNally, Fiction Publisher at Puffin says "James Bond is the world's biggest spy brand and Charlie's writing is perfect - gripping, suspenseful and very true to the original Bond. We've had enough of wannabes - this is the real thing." "James Bond is thirteen and just about to start at Eton having been educated at home by his Aunt Charmian since the death of his parents. The first adventure takes James to a remote Scottish castle where a wealthy American has been conducting some very disturbing experiments..."
Rebecca McNally, Fiction Publisher at Puffin, told MI6 today: "We are VERY excited about our new James Bond titles - they're a hugely important acquisition for Puffin, and also a much needed addition to the market for 10-13 year-olds." MI6 has officially confirmed that the first title by Charlie Higson is due in March 2005, with the second installment in the series expected to hit shelves in November 2005. The books will not be illustrated inside, but Puffin are currently working on the style for the jacket artwork under top secrecy. The swing away from adult continuation novels is clearly an attempt to tap in to the lucrative young readers market that has reached new heights in recent years thanks to the likes of "Harry Potter" and "The Chronicles of Narnia" series. This latest spin-off going back to 007's youth has been done before with the cartoon show "James Bond Jnr", which also spawned a short stint of comic books, although this series will be based on Fleming's character rather than the movie incarnation. The move also echoes "The Young Adventures" of Indiana Jones, which brought about a popular television series on the back of a highly successful movie franchise. Charlie Higson will be well known to most UK comedy viewers. He has penned "The Fast Show", "Harry Enfield's Television Programme", "Swiss Toni" and the Reeves & Mortimer vehicle "Randall & Hopkirk (Deceased)". Outside the world of television, Higson wrote the screenplay "King Of The Ants" (2003) starring Kari Wuhrer, Daniel Baldwin and Chris McKenna. 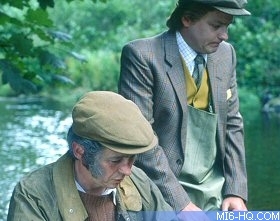 Left: Paul Whitehouse and Charlie Higson as Ted & Ralph from "The Fast Show"